Salvatore Robuschi produces industrial centrifugal pumps including chemical industry screw pumps, pumps with a large dirt filter, horizontal, multi-stage centrifugal pumps, self-priming, side-entry impeller pumps and cantilever pumps, also called tail pumps. The pumps are produced in a wide variety of materials including cast iron GG 25, cast iron GGG40, stainless steel AISI 316, Duplex, Superduplex and if requested, even other alloys. Salvatore Robuschi waste water pumps are available with a closed channel impeller, a half open impeller or a recessed impeller. What is striking about the Salvatore Robuschi RC series with vortex impeller is their large dirt filter which enables 90% of the dirt to pass through the diameter of the discharge port. Salvatore Robuschi RS pumps are equipped with a recessed impeller and made in stainless steel AISI 316. Many Robot pumps are currently being replaced by the Salvatore Robuschi RC pumps. Given the large dirt filter, the Salvatore Robuschi pumps are often used in water purification installations in, for example, slaughter housings. Salvatore Robuschi pumps can also be delivered in a cantilever version. The huge advantage of these Cantilever pumps is that they do not have a mechanical seal or a slider bearing, so the number of parts that can wear is minimal. Salvatore Robuschi Cantilever pumps can be placed in the liquid tank or next to it. Cantilever pumps for hot baking oil are often placed next to the oven. 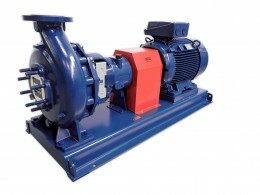 Bedu Pumps is also specialised in the repair, overhaul and maintenance of Salvatore Robuschi centrifugal pumps.